The sushi rolling mat can be very useful, although, with some experience you can do without it. The rolling mat is used to maintain even pressure from all sides of the sushi roll while rolling it. When used to make an inside out roll, the mat needs to be wrapped in saran wrap in order to keep the rice from sticking to the mat. This may also be applied while making a classic roll to make the mat easier to clean during the process. How do I pick a sushi rolling mat? 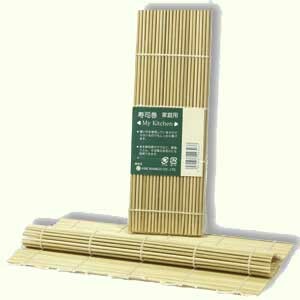 There are two kinds of bamboo rolling mats on the market. First you have the cheap kind, where both sides of the mat are rounded. That’s bad. The second kind, might cost you a buck more, and features the “top of the line” western technology: one side is rounded and the other is flat. You will soon find out that a rolling mat with one side flat is a lot easier to use, and brings you much more impressive results.